What do a top athletic equipment maker, a food service giant, and a railroad operator have in common? That's right, they all just made their shareholders a little richer. Income investors will be sorry to see November go; it was, after all, a fine month for dividend raises. It's certainly not going out with a whimper either, as several high-profile companies declared bumps in their payouts. Here are three notable recent raisers. Reliably profitable athletic gear incumbent Nike (NYSE:NKE) is also a reliable dividend payer. It's lifted its quarterly distribution once every year for what's now 15 years running. The latest hike is a 13% boost to $0.18 per share. The company isn't doing badly against stiffened competition from the likes of relatively young upstart Under Armor and hard-charging veteran Adidas. In its Q1 of fiscal 2017, Nike's revenue grew by 8% on a year-over-year basis to over $9 billion, while net profit advanced by 6% to almost $1.25 billion -- significantly higher than the average analyst estimate. 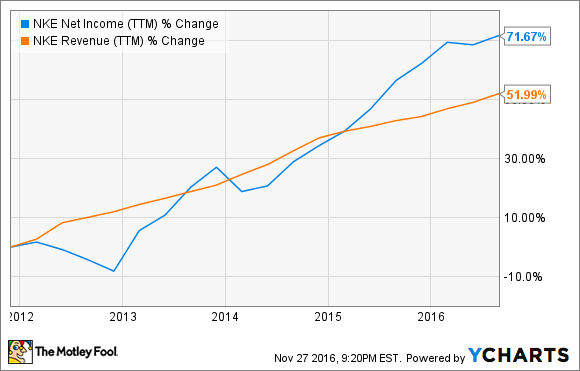 NKE Net Income (TTM) data by YCharts. On the down side, shareholders weren't cheered by the growth in the company's current period -- its "worldwide futures orders" (i.e., order volumes over a six-month span) grew at a 5% clip for the stretch culminating at the end of this coming January. That's down from the 9% of the same period the previous year. But I don't think investors should worry, either about Nike's prospects or the future of its dividend. It's still a world beater in its industry, it continues to grow its business, and its operating and free cash flow tallies are both on the rise. This remains a very good stock to own. Nike's upcoming dividend is to be paid on Jan. 3 to stockholders of record as of Dec. 5. At the most recent closing share price, it would yield 1.4%. 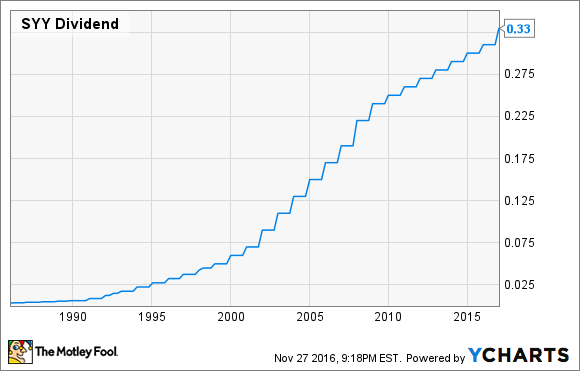 That's low compared to the current 2% average of dividend-paying stocks on the S&P 500. A host of distribution hikes in November have come from the dividend aristocrats, the exclusive group of stocks that have lifted their payouts at least once annually for a minimum of 25 years in a row. The latest high society raise is from food service mainstay Sysco (NYSE:SYY), which is bumping its quarterly dividend by 6% to $0.33 per share. SYY Dividend data by YCharts. The company had some very nice-looking figures in its most recently reported quarter. These included a top line that was 11% higher (at almost $14 billion) than in the same period of fiscal 2016, and a net profit that rose a beefy 33% to $324 million. Much of this was due to the absorption of European foodservice company Brakes Group, a roughly $3.1 billion acquisition Sysco closed this past summer. Yet even without that asset in its portfolio, Sysco would have seen a pleasant rise in earnings; its bottom line, adjusted for the acquisition plus other one-time items, grew by 13% to almost $356 million. Sysco is a fairly conservative and sensible manager of its cash. Its total dividend payouts have tended to be more than adequately covered by free cash flow which, incidentally, has risen lately. So I expect the company will keep up those distribution raises it's so fond of, into at least the foreseeable future. Sysco's new payout will be dispensed on Jan. 27 to investors of record as of Jan. 6. It would yield a theoretical 2.4% on the current share price. Railroad operator Union Pacific (NYSE:UNP) rounds out the trio for this edition of our series. The company is hiking its quarterly dividend by 10% to nearly $0.61 per share. This is the first raise it has declared since the end of 2014. Additionally, the company refreshed its stock repurchase program, authorizing the buyback of up to 120 million shares by Dec. 31, 2020. Both moves will certainly please stockholders, although they come at a somewhat gloomy time for the company. In its Q3 Union Pacific recorded declines in volumes (down 6% on a year-over-year basis), revenue (6% lower, to $5.17 billion), and net profit (a 13% drop to just over $1.1 billion). The company put the blame on the shaky global economy, a strong dollar, and weak demand for consumer goods. None of these challenges are likely to fade away soon, so expect the railroad giant to continue to struggle. In spite of those headwinds, Union Pacific has managed to improve its operating and free cash flow numbers in recent times. But it's going to be shelling out a bit more for its dividend, and that share repurchase initiative is typically aggressive for this avid buyer. The company always manages to at least maintain its payout, but I wouldn't necessarily expect another raise to come down the tracks soon. 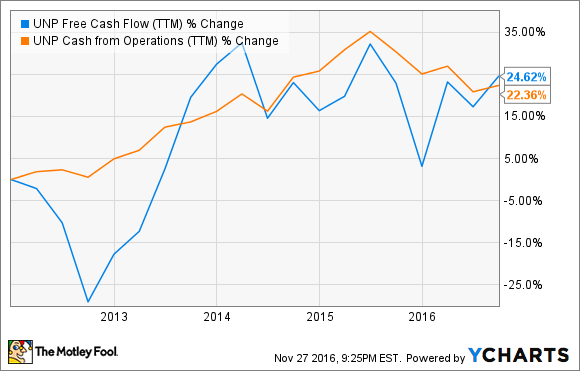 UNP Free Cash Flow (TTM) data by YCharts. Union Pacific is to pay its freshly raised dividend on Dec. 29 to shareholders of record as of Nov. 30. At the current share price, the new payout would yield 2.4%.